One of the most expensive costs in running your cellar is your cooler. 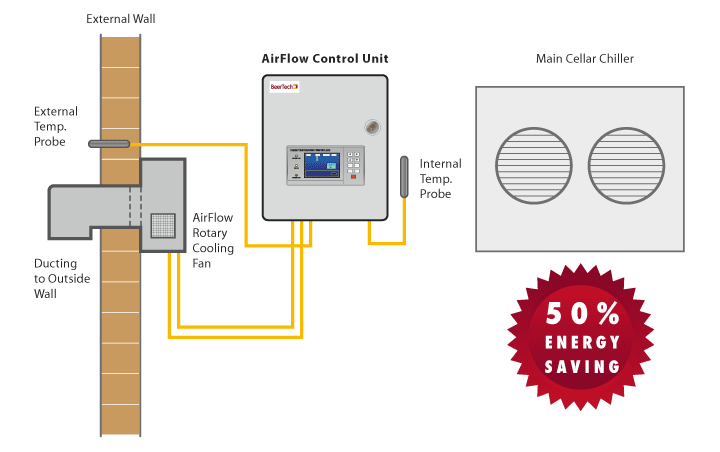 In simple terms, AirFlow, using ambient air from outside, will cut your energy costs by at least 50%, giving average electricity savings of £800 – £1,400 per year. BBC weather forecasts indicate that for around 60% of the year outside temperature is 10ºC or less. The AirFlow system, with an outdoor probe sensing this temperature, brings in the ambient air from outside, maintaining the cellar temperature between 10ºC and 12ºC. Therefore, your cellar coolers thermostat, sensing the temperature is correct, simply keeps the main chiller switched off. However, it is important to note that the internal fans continue to run as normal using only 200 watts and not 3-5kw. A general consensus between refrigeration engineers is that the condenser part of the celler cooler system (the expensive part) will operate on average for around 10 hours per day. Based on a 3.5kw cooler – 16p x 3.5kw x 10hours=- £5.60 per day = approx. £2,044.00 per year. As indicated above, Airflow will cut this cost by at least 50%. Greene King, with over 300 pubs already installed are continuing to roll out. Marston’s with over 200 pubs installed and continuing to roll out. Spirit with 100 pubs installed and now rolling out. Also installed in M&B, working men’s clubs and many independent pubs across th UK. To date we have over 1,000 installations, in both above ground and underground cellars with forward orders for a further 700 pubs. Average return on investment is less than 12 months. Naturally the main benefit is energy cost saving for your cellar cooler, saving £800 – £1,400 per year. After rigorous trials our product is now being installed into many major groups, individual pubs, hotels and clubs. Compressor noise is greatly reduced in built up areas with no need to switch off your cooler, the Airflow system will continue to maintain correct cellar temperature. With running times greatly reduced gives a high probability of extending the life of your cooler and dramatically reducing expensive call outs. There is also the benefit of a reduction in carbon emissions. Airflow is guaranteed for 12 months. Thereafter a maintenance service contract is offered.